In addition to disgraced former NBA referee Tim Donaghy admitting to betting on over 100 games that he officiated, he is now stating that relationships among officials, coaches and players have "affect[ed] the outcome of games", that there were gambling activities of other NBA officials and that a referee passed "confidential" information to an unidentified coach. 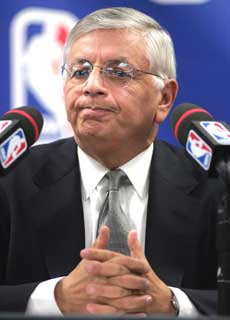 As someone who works in the business of communications, I have to hand it to David Stern and the NBA for effectively getting ahead of and burying this Donaghy saga. These new revelations, however, will undoubtedly add fuel to the fire of basketball conspiracy theorists everywhere. And there are no shortage of these theorists among Jazz fans. Obviously, if other NBA referees have intentionally skewed games, (or are currently doing so) then placing bets on these games, they are breaking the law just as Donaghy did. For fun's sake, let's get out the tinfoil hats and assume that other referees are not gambling, but that Donaghy is telling the truth regarding the NBA using subtle tactics not to completely manipulate the outcome of games, but to make the outcome more likely to fall in a way that the NBA desires. How would this ever be brought to light? I'm no lawyer, but as I see it, absent of the racketeering, the NBA would not be doing anything illegal. If it is not illegal, the Justice Department has no incentive to expose the NBA, and a big disincentive in the form of a civil lawsuit for exposing confidential business practices. Furthermore, since the NBA is a privately held corporation, they are not required to provide anything other than basic financial transparency regarding their business operations. Lawyers, am I wrong? Do we want to know? Would Jazz fans feel vindicated by such a revelation? Or would the fun of formulating conspiracies, as well as following NBA basketball, be forever ruined? Yes, the NBA would be screwed if they got involved in this. Criminally they might not have too much to worry about, but the civil judgments from owners of teams not in on the scandal would be enormous. Also, if the NBA is trying to rig the game so that popular teams win, they are doing a horrible job. The Spurs are near the bottom in popularity/market base and they do pretty well for themselves. I think Stern may try to tip the scales in very subtle ways, but I'm not sure he brings anyone else into his arrangements (like refs or players or even other NBA executives). There's just too much risk of exposure because eventually someone always talks and these days there's usually an e-mail trail. Then his cover is blown, the league gets a huge black eye and is probably ends up worse off financially than if he'd never messed with it in the first place. However, I would not mind him issuing a secret league rule that says the Spurs don't get to win another playoff series for ten years, I can tell you that much.